Instantly transform your eye area! Tighten, firm and smooth the eye area to instantly minimize the appearance of crow’s feet, fine lines and deep wrinkles while diminishing under eye puffiness. Visibly diminishes under eye puffiness. 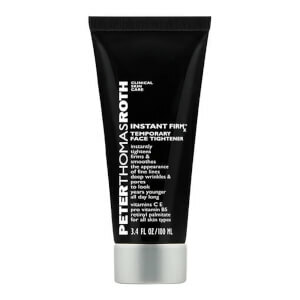 Immediately smoothes and tightens skin. Vitamins C and E provide antioxidant protection. Shake well. Sparingly apply a thin layer to freshly cleansed, dry skin. Remain expressionless. Product will dry within 3-7 minutes. When face feels pulled and tight, look in the mirror. At this moment, you'll look years younger. Enjoy! Use either damp cloth, cotton swab or fingertips to pat away any visible excess residue. Water (Aqua), Glycerin, Butylene Glycol, Sodium Silicate, Sodium Magnesium, Fluorosilicate, Magnesium Aluminum Silicate, Symphytum Officinale Leaf Extract, Foeniculum Vulgare (Fennel) Seed Extract, Medicago Sativa (Alfalfa) Seed Extract, Argania Spinosa Kernel Extract, Spilanthes Acmella Flower Extract, Hydrolyzed Lupine Protein, Palmitoyl Tetrapeptide-7, Dipeptide-2, Panthenol, Tocopheryl Acetate, Retinyl Palmitate, Ascorbyl Palmitate, Phospholipids, Chondrus Crispus (Carrageenan), Hesperidin Methyl Chalcone, Steareth-20, Sodium Cocoyl Glutamate, Caprylic/Capric Triglyceride, Disodium Edta, Bht, Phenoxyethanol, Methylparaben, Propylparaben, Ethylparaben, Butylparaben, Isobutylparaben. I am in awe of this product! I highly recommend trying it. The trick is to use very little on clean skin. Just pat a little under each eye and don't squint! Simple as that! As soon as it dries, in under 5 mts, you will be truly amazed! I. The last month I have been asked if I am a twin to my sister who is 10 years younger, believe me this has never happened since using this product. I use just his under eyes and carefully apply my foundation. Simple, less is more!! This does exactly what it was advertised to do, you will not be disappointed. This stuff really works, use lightly! And use with a tiny bit of light eye cream so that you don't get a white flaky appearance under your eyes. Lasts forever. This product does work - I have bags under my eyes and it really makes them go away - BUT I cannot get the white bumpy look of the product to go away - so it looks like I have white crumbles under my eyes. I have tried mixing with under eye makeup, but it is all bumpy under my eyes that I end up wiping it all off! Please if anyone has any tricks let me know - because it does work. THIS DID NOT WORK FOR ME! This is not for every one. Dr. Oz recommended it but because of my sensitive skin, the cream burned and when it dried it was harsh and abrasive trying to wipe off.It may work for others but it definitely did not work for me. I purchased this thinking I'd found my miracle eye cream for my baggy, droopy eyes. It worked great, that is until it dried leaving a white residue. Once you wipe away the residue, of course you wipe away the effect. I tried all the suggestions on the box, but nothing worked. If they could modify the formula to ditch the chalky white residue, I'd love this stuff. For now? I'll stick with Oil of Olay and my baggy eyes. It works but it also has problems. After application-then you let it dry for about five minutes-the lifting action takes places-looks fabulous-BUT- then the white residue is sitting on the skin and you have to gently remove it-9 out of 10 times upon gently removing(tried various was to keep it gentle)the line will return to its original state (UGH)I keep trying to make it work better -at night-when it doesn't matter about the white residue you will wake up without the lines.I guess don't wash your face again for the day. But it's still a wonderful concept.